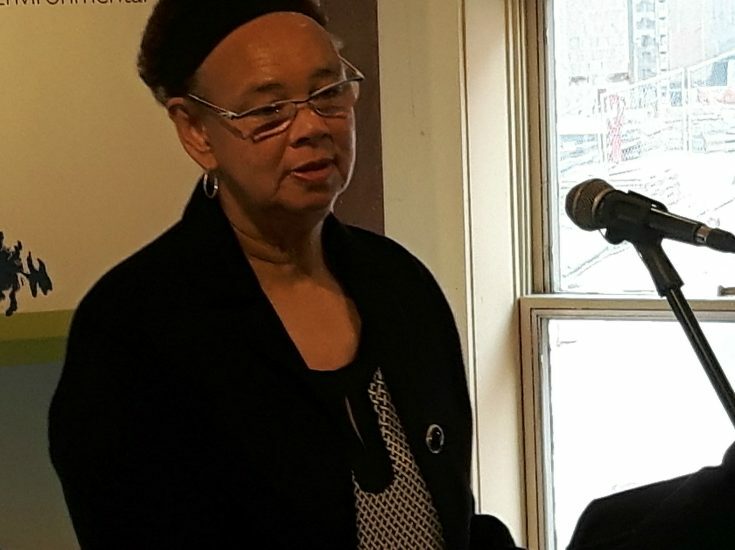 KJIPUKTUK (Halifax) – This morning at the launch of the Environmental Bill of Rights Louise Delisle, a resident of the Black community within the Town of Shelburne, spoke about the damage done by pollution from the town dump placed right in the middle of the community. With her permission we publish that speech here. Earlier we wrote about the issue here. Good morning. I am here this morning on behalf of the South End Environmental Injustice Society (SEED). This is a group we formed in the Shelburne community. We are in awe why so many black men have passed away in our community. This is a community of widows. Families in the South End of Shelburne are facing serious health and economical issues because of the deaths of so many Black men in our community. There are these high rates of cancer and other health issues that have been caused by the community being exposed to the landfill, the dump, that was placed in the middle of our community, a town dump that was used by industries like the shipyard and the government naval base. It was like a dumping field. In the community we would see men go by in huge naval trucks, dressed in white, what we would call hazmat suits today, and dump God knows what there. We don’t know. Anecdotal information has shown that living next to this dump has caused numerous health issues in the Black community. We believe the health of one person is inseparable from the health of the entire community. That health is closely linked to the environment where the community lives, works and plays. The dump was an invasion of our health. The dump was located in the Black community. In the fifties and sixties, there were 56 very large families living around the dump, all within 1000 meters of the centre of the dump. The dump was located on a hill in the centre of the community. Sometimes the garbage was so high that they had to set it on fire. For days it would burn. For days it would smolder. And the smell was so pungent that people would be physically ill for a time, for the air was so polluted with ash from whatever was dumped there. We were exposed to things that came from the shipyard, the naval base, the hospital, which at one time was also a tb ward. We don’t know, and nobody ever bothered to ask us if it was okay to dump all that there. I talked of the high rates of cancer in the community. This environmental pollution not only caused cancer, it causes low self esteem. If you live close to the dump you weren’t accepted. Not just because just you were Black, but because you lived there. It seems that the members of the Shelburne community have died at a higher rate than the population in the North end of town. We wonder why. So when all this work that we have to do is completed, we hope that the government will help us and find out why we have become a community of women. The next generation of men that have gone away, our sons and nephews, seem so far not to be affected. But our fathers, our grandfathers, our brothers, have died of cancer. Is it because we live next to the dump, because they put the dump in the middle of the community? When all this work is complete, the Black family members still alive and living in their homes in the area of the dump will be seeking some kind of compensation for this environmental racism in our community. I think this Bill will help, because when my father was gone, who died of cancer along with my brother, members of the Black community could not speak of such a thing. We were not allowed to speak. They would never speak for fear of repercussions, not being able to care for their families if they spoke up because they would lose their job. It is a heartbreaking thing to know that you have lost one of the main supports of your family unit which is the men in your community. Thank you for speaking out on toxic dumps in communities who had no choice, no voice and no respect.